There was a time, once, when we thought to form a group - a pop group. The idea stemmed from a friend, the improbably named Lyn Long, whose tenuous claim to fame at that point was that her father had been a Member of Parliament serving under Clement Attlee in the post-war Labour government. Our aim, and upon this our popularity would depend, was a revival of old songs, a reinvention of nostalgia. And, as such, our signature tune was to be 'We'll Gather Lilacs in the Spring Again'. Needless to say, it all came to nothing. We were reminded of this only yesterday when, to have flowers in the apartment over Easter, we ventured to the outside market. Predominantly dealing in fruit and vegetables, with some cheese and meat, and in glorious disregard of all European Union dictates, the market operates daily throughout the year. However, it is at its best towards the weekend when, in addition to the regular stall holders, the old grandmothers come in from the country, their baskets groaning with homemade produce. ﻿﻿There are to be claimed jams and chutneys, pies and pickles and, of course, garden flowers. And so we found our Lilac. Still dripping with the morning dew [although here, perhaps, a little poetic licence has been allowed to creep in] we gathered armfuls intent on filling the rooms with its potent scent. ﻿And so we have. But today, looking to top up the water in the vases we note, somewhat sadly, the heads are turned downwards, the green leaves wilted, the life force spent. Those lilacs are lovely. Have a wonderful Easter. Thank you. They were lovely - briefly!! 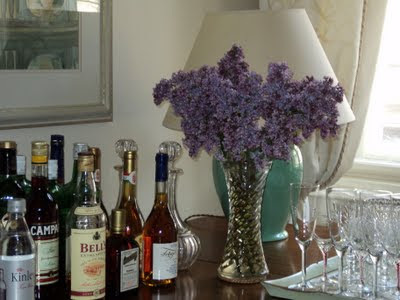 I had the same problem with my lilacs, we don't have a lilac tree so I stole them from next doors garden (holiday home) I think part of the joy is arranging and then savoring them for a few hours, it happens a lot with cut flowers from the garden. Am very impressed with your drinks table! This is reassuring as we thought we must have done something to them. In the event, they barely lasted long enough to take a picture, and by which time the leaves were, well, dead! Loved both the song and the lilacs. We had a white lilac tree in Amsterdam which had the most wonderful scent. hola! give those blooms a taste of that whiskey next door to them and they will likely revive! J'adore lilacs. They're not easy to come by here. Your drinks table is so elegant! I don't know about lilacs, but lavender can be hung upside down in bunches after it has had its life. It remains useful and spirit raising for ages. I'm always so impressed when people have fresh flowers - love the lilacs!! but comforting to know I'm not the only one that finds them wilting so quickly. But lilacs!! Ahhhhhhhhh - my sister got married with lilac bushes blooming all around. Such fragrance - I love that scent so much! Thank you so much for reading and commenting on my blog! It really means a lot to me - Happiest of Easters to you! 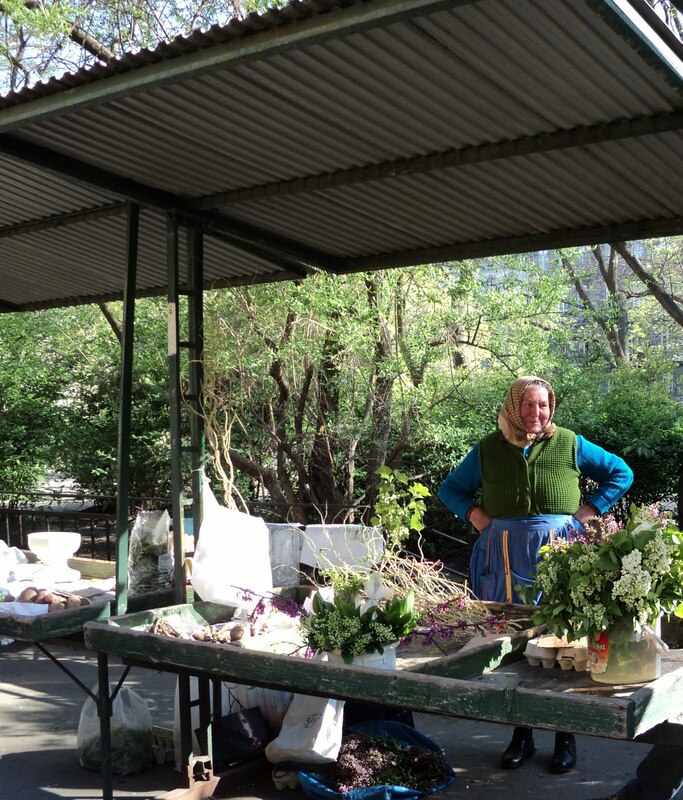 The market sounds wonderful...I love lilacs especially white. ...actually decorated the church when we were married with them....somehow I don't remember them fading quite so quickly...manybe they are especially hardy in Canada LOL! Love the photo of the outdoor market. What are you not suppose to do according to the European Union Dictates ? No year around markets ? I too am impressed by the drink table and although I do not drink anymore I loved Campari. Tip of the day: Always strip the Lilac flower stems of their leaves, and add flowerless leafy stems to the arrangement. This way they last much longer. If you leave flowers and leaves on the same stem, they'll wilt almost at once. We are so pleased that you enjoyed the song which must have been recorded years ago. We rather thought of drowning our sorrows with the whisky rather than topping up the Lilac which, this morning, has had it!! Thank you so much for becoming a Follower. We too love Lilac - one of our favourite flowers but clearly not so good when cut. How kind of you to mention the drinks' table. Sometimes we think that it is put to too much use!! You are so right about Lavender which remains fragrant long after the flowers have gone over and which fades to a really rather pleasing colour. We should perhaps try it with the Lilac, but today it is all in the bin! Yes, we do so agree with you about Lilac and, from what you say, your sister's wedding must have been perfect. Lilac time is such a joyous time of the year and one we must all make the most of. Yes, the market is rather splendid in a completely unsophisticated way and we are very fortunate to have it so close to home. The white Lilac in the church when you were married must have looked and smelt wonderful. What a very happy memory to have. The EU now, almost daily, although this is a slight exaggeration, issues edicts as to what the Member States may or may not do. Many concern health and safety and are, by and large, absurd. Some countries, like Hungary, do not take too much notice; others, like the UK, follow the rules religiously. Thank you so much for the tip which we shall certainly follow in future. As you may imagine the Lilac, now dead, has been something of a disappointment! R.I.P. to the lilac... but thank you for sharing the lovely image of it with us, and the idea of the EU-flouting everyday market. As for the drinks table, yes I noticed the Campari too: Luton Airport! Thank you! The Lilac was buried this morning in a quiet, private ceremony. We trust that the reference to Luton Airport signifies that you are jetting off somewhere special. Bon voyage. Or, of course, it might be a joke, unknown to us, which links Luton Airport with Campari!! 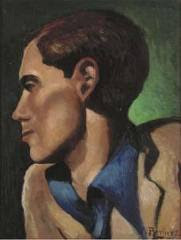 I've always loved the songs bu Ivor Novello (it's overdose of nostalgia). I've usually associated this particular song with the duet version of Anne Ziegler and Webster Booth. How delighted we are to hear from you as we thought, possibly, that you were away. In your absence, we have enjoyed ourselves by reading through many of your previous posts. They are delicious and kept us up well past our bedtimes. So pleased that you like the song. Had you been around, then perhaps the pop group could have taken off! The Anne Ziegler/Webster Booth recording is known to us but was rather crackly on YouTube so we plumped for June Bronhill. A pop group, what a wonderful and interesting back story and I am sure you would have been chart toppers. How great it must be to enjoy the availability of a market every day all year. Around this area they are only open during the short growing season we have. The picture you choose to post is pure visual art and I absolutely the stance of the vendor; she could be the worlds Grandmother. Alas, woody stemmed blooms are a disheartening lot but your presentation here is so elegant that one forgets how fleeting the blooms are. We think that you are, possibly, being a little too generous here with regard to the likelihood of our ever having succeeded in entering the charts. But we must all have our dreams!! We are so lucky with the market and do make good use of it. The grandmothers are our favourites - the one we photographed is there most days. Lovely follower, we like your blog too!! Oh yes, you are so right, there can never be too many. In our minds the whole apartment was to be filled this weekend with Lilac, the wonderful scent drifting from room to room. Alas, it has not worked out as hoped but it was glorious whilst it lasted. Peonies are also great favourites of ours. Lilac's are my absolute most favorite flower and I so wish they lasted longer (I'm sure along with everyone else)...can you just imagine if they were like a hydrangea and they would last for a few weeks and then dry to perfection...but alas, they are just to delicate for that...the more so to treasure them. Here's a tip...if you hammer the edge of the stem and crush it a bit, and then stick a sharp knife (all sounds horrible, I know) up higher through the stem, they will absorb water a bit more and last a touch longer. The sharp knife trick works fabulously with tulips also, but not the crushing! Happy Easter to you both, and may you have many more lilac bunches to enjoy during this beautiful season!! Oh, this is such good advice. If only, as they say, we had known sooner! Mass burials have already taken place and now we are bereft of flowers until the market springs to life again on Tuesday. We are thrilled to see that you have become a Follower and look forward to continuing our dialogue on future posts. Ahhh the markets, one of my favorite aspects of living here also ! Produce is one market, the flower market is another, then the bakery and so on .. I like 24 Corners trick ! although I have to say I have no memory of seeing lilacs here. They must be here, don't you think ? Instead , I have Gerbera daisies in all bright colors .. fall is slipping in and bringing chilly days ..
Oh I found you at Debs and love your site! If someone hasn't already mentioned this, when you replenish the water, snip the woody stems at an angle. Ah lilacs...they always mean Spring to me. My former home in Boston had 4 large lilac shrubs and I used to fill my home with vase after vase full of them until the smell permeated the whole place. I can smell them (and yours) now! Markets are indeed one of the great joys of life. We love buying everything in season and locally instead, as in the UK, weekly from a supermarket. How strange to think of the approach of autumn with you as we are in the midst of spring. But all the seeasons have their own special quality, don't you think? You are so right, Lilacs are so evocative of the spring. How splendid it must have been to have had them growing in the garden, and then to fill the house with freshly cut blooms. How kind of you. We are so pleased that you have found our blog and we shall certainly pay you a visit. Thank you too for the tip about snipping the stems of the Lilac at an angle. We shall replace the dead ones after the weekend and will certainly do just that. Lilacs are so lovely, they look amazing, or maybe that should be looked. I do love going to the open market here in Brighton now and then, for a look around and fill my basket. Bill's produce store used to be a lovely place to wander around for a while. We're lucky enough to have two lilac bushes here...I pick them just as the little buds are opening. I noticed that your little clip was made by a fellow Victorian, ballaratboy, featuring our darling June Bronhill. She was such a bright, lovely woman; very popular with audiences here. I, too, had visions of an all-girl music trio when at high-school but it didn't eventuate, unfortunately. Something I miss here in Tuscany, it's too warm a winter to grow lilacs as they should be grown, they come out spindly and ungenerous. We had them in the garden in Massachusetts and my mother brought them in in great quantities and I'll never forget how the house smelled then. The song in the background of my reading was enchanting. We agree that Lilacs are lovely but, in our experience, very short lived in water. When we are next in Brighton we must search out the markets, something we have not done to date. There is apparently a relatively new Farmers' Market somewhere in North Laines [or close by]. How lovely to be able to go out and pick Lilac, or other flowers for that matter, in bud. That is one aspect of not having a garden that we miss. Yes, we thought the June Bronhill clip was great fun, if not a little 'camp' today! We had not considered the fact that Lilac might not do well where the winters are less cold. Here in Hungary, where the winter temperature can drop to -20C, whilst in summer it reaches +40C, Lilac appears to thrive. The house in the USA filled with sweet scented Lilac sounds wonderful. Have you wafted in from Paradise? How really stupid of us. Yes, of course, we remember that advertisement so well - just had not linked it with Campari. Sorry you are not jetting off. B&Q seems a poor substitute. But such is life! We are delighted to have your comment for which many thanks. We have, indeed, visited your beautifully presented blog but, sadly, our Spanish is not up to understanding fully what you write nor to leaving a comment. It is so nice to hear again about your hereabouts. We also buy flowers, now and then, from the ladies at the market. I like the atmosphere of the local markets. the lilac look really beffiting in your Morning Room. So English! We are so pleased that you too enjoy shopping in local markets. It is, we feel, important to support them in the face of growing globalisation. Hello, I'm visiting via Jeanne at "Finding my way...in England". Your blog is lovely and I'm enjoying learning more about Budapest. I'm visiting Budapest in July and learning all I can before the journey. Blessed Resurrection to you and yours. We are so pleased that you have signed up to follow, and thank you for such a generous comment. How wonderful that you will be visiting Budapest in July. We are sure that you will find much of interest in the City, the Queen of the Danube in our view. Do let us know if there is anything we can help you with. Sounds like you had a wonderful day. I can't believe you're in the middle of such a lavish spring. The country woman is lovely. That is so kind of you. While the Lilac lasted they were lovely. Alas, they were only with us for about a day and a half!! Sigh...lilacs are fragrant and fleeting. I love your photo of the grandmother-type at the market. She looks like a character from a book! Glad you liked my bunny post. Re: your friends' rabbit pet--I would imagine they are not as "user friendly" as cats, but I like the idea of it, anyway! We have had a lovely Easter and we do hope that you have had too. We do agree, all of the country women who come to the outside market are similar - absolute characters and so very, very kind. Yes we do so agree about the Lilac - wonderful, and then gone in an instant. Perhaps like so many of the good things in life. Looking at your drawings is giving us so much pleasure. Far better, we feel, in the case of rabbits than to have one as a pet! Hello - and welcome to my world! Thanks for stopping by! We click some buttons and arrive in another land. How amazing is this blogging lark? I like how you are able to put titles underneath your photographs. Yes, we agree, the blogosphere is amazing keeping one in contact with people all over the world. With the new version of Blogger it is very easy to add titles to pictures. We shall very much hope to see you again. We have a lilac in the garden. While beautiful, I am surprised it is not fragrant. Since this is our first year to rent this home, we are having lots of new discoveries in the garden. Right now, it has never been more beautiful. It is such a pity that your Lilac appears to have no scent. Isn't this just the way of the world?!! Having a new garden and discovering what is growing is always great fun. The first year can be so exciting. Lilac trees seem to be flowering profusely everywhere this year. The scent is lovely. My mother has a special procedure for keeping lilacs fresh in vases. She always gathers the blooms at dawn, ensuring that the stems she cuts are full of buds, as well as open blooms. She then plunges them in a bucket of hot water and then cuts the stems at a 45˚ angle, about 2-3 cm from the end, stripping the leaves from the part of the stem that will be submerged. She then puts them in the vase with cold water. They last for at least a week. I always associate lilacs with Greek Easter and Holy Week, which makes them a rather mournful flower for me. How really kind of you to go to all of this trouble over how to keep Lilac as cut flowers. We are certain that, from the detail you give, your mother knows exactly what should be done and we shall, when we buy more this weekend, follow her advice to the letter. We did, in fact, have a lovely Easter - always for us a favourite time and one we much prefer to Christmas. I have just stumbled into your blog and am fascinated by how the subject of lilac has brought so many people together with such enthusiasm. Blogging is a wonderful thing. Anyway, here in the north we are still drooling over the snowdrops, so, my lilac days are not expected until June. I'm sure, when that time comes I will be just as seduced by their beauty and scent and just as disappointed when they wilt indoors. You didn't mention all the little spiders and insects that invariably get a free passage into the house with the lilac! How lovely to have your comment. Yes, the Lilac is wonderful and beautifully scented, and yours is clearly yet to come, but such a disappointment when cut and put in vases indoors. As for the bugs which come in with it.....we will not go there! We are so thrilled to see that you are Followers after all Anne has told us about you! Lilacs in the Spring are absolutely wonderful and this year the trees have been flowering profusely right across Europe. We should definitely miss them. This was my grandmothers favourite song. She died 10 years ago at the age of 98 and this has made me quite emotional hearing it again. The lilacs look lovely but alas, blossom does not fare well when cut. I hope you enjoyed the scent whilst you could! You are so right. The Lilac lasted barely long enough to be photographed!! How splendid that your grandmother should have lived to such a grand age. And although the song made you feel emotional, we do hope that it also served to bring back many happy memories. We count ourselves very fortunate that country people still come every day to our local market with their eclectic offerings. One never knows what one is going to see on any particular day, but one can always rely on it being very good indeed! !